The presidential candidate of the Peoples Democratic Party (PDP), Alhaji Atiku Abubakar, has insisted that the Independent National Electoral Commission (INEC) unlawfully and unconstitutionally declared President Muhammadu Buhari winner of the February 23 presidential election. Atiku, a former vice president between 1999 and 2007, maintained that Buhari did not win the poll and pleaded with the Presidential Election Petition Tribunal to so hold. In his reply to the INEC’s position to his petition challenging Buhari’s victory, Atiku said contrary to the electoral body’s claim, his petition is meritorious and should be adjudicated upon by the tribunal. In the reply filed by his lead counsel, Dr. Livy Uzoukwu SAN, the PDP presidential candidate accused INEC of unduly and wrongfully returning Buhari as the winner of the poll. Atiku, who faulted the position of INEC on all grounds, claimed that the electoral umpire failed to answer the points of substance he raised in his petition but came out with a defense full of extraneous facts, contradictory, evasive, speculative and vague assertions. The PDP candidate claimed that contrary to the INEC’s assertions, his petition challenging the qualification and the scores credited to Buhari is competent and contains the result of the February 23 election as declared by INEC and as mandatorily required by law. Atiku said that the official website of INEC was regularly visited by participants in the election including him and that his claims in his petition were all obtained from the INEC’s website. Besides, the PDP presidential candidate alleged that INEC committed several blunders during the collation of the presidential election results by crediting false result to some of the presidential candidates. Specifically, the former vice president pointed out that the INEC Chairman, Professor Mahmoud Yakubu, who was the returning officer for the presidential election committed grave error in the final collation exercise when he falsely credited Okotie Christopher with a wrong political party and wrong scores just like he did in that of Dr. Onwubuya with a wrong political party. 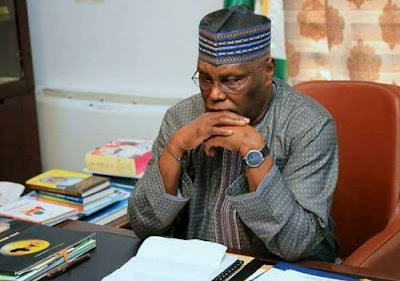 Atiku further insisted that the returning officer for the presidential poll falsely credited Ojinika Jeff Chizee with a wrong political party and wrong scores in the same way and manner he attributed a wrong political party and wrong scores to Abah Lewis Elaigwu. He stated that the grave errors were under the hands and signature of Mahmoud Yakubu in the conduct of the final collation of the results of the presidential election. Contrary to the claims of INEC, Atiku insisted that the table containing votes of candidates are not a conjecture but the results of the acts of INEC, who complied with the directive and training instructions of the electoral body on electronic transmission of votes. Atiku, who challenged INEC to produce the manuals and print outs used for the election, maintained that the servers from which he got the results used in his petition belong to INEC, adding that there is no conjecture in the votes and scores in the table he pleaded. The PDP candidate explained that the spokesman for the Muhammadu Buhari Campaign Organisation, openly admitted that the data he pleaded was that of INEC server, when he wrote and submitted a petition to the Inspector General of Police and the Director General of the Department of State Service, asking the security agencies to Investigate him (Atiku) for allegedly hacking into the server of INEC and obtained the data in question. Atiku pleaded the petition signed by Festus Keyamo SAN and the newspapers reports, television broadcast and news report in the social media on the public admission made by Buhari’s Campaign Council. He, therefore, urged the tribunal to dismiss the objection of INEC to his petition and to uphold it in the interest of justice.